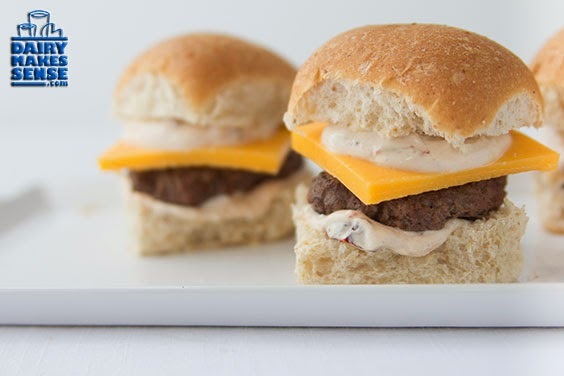 No matter what the occasion you're celebrating--Derby Day,graduations, weddings or just welcoming warmer weather--Beef Sliders with Chipotle Yogurt Sauce and Cheddar Cheese is a perfect recipe for kicking off the May grilling season. You can find this recipe highlighted at Dairy Makes Sense. For sauce, in a medium bowl, combine yogurt, chipotle pepper(s), adobo sauce, and cumin. stir until well blended. cover and chill to allow flavors to blend. For slicers, shape beef into 6 patties about 3 inches in diameter. Cook beef on an outdoor grill or a grill pan over medium heat until center registers 160 degrees with a quick-read thermometer, turning once during cooking. Remove from heat. Spread 1 tablespoon,divided, Chipotle Yogurt Sauce, on top and bottom of each bun. Transfer each beef patty onto a bottom bun. Add a cheese quarter and top bun to each slider. Serve warm.